New business owners don’t wake up every morning and say “Oh boy I just can’t wait to do that accounting paperwork today!” (unless you’re starting an accountancy business that is. If so, what are you doing here? You should know this stuff). 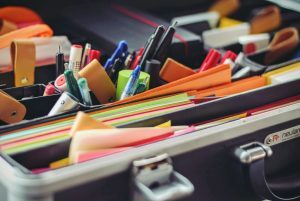 Paperwork, especially financial paperwork, is probably the least enjoyable part of running a small business (or any business); unfortunately, it is also one of the most necessary parts. Thousands of new businesses are made every year and every year hundreds fail to file their accounts properly and get hit by a fine. Nearly 30,000 businesses were hit by fines for late fees or incorrect returns in 2016, and it seems like the number keeps rising. Read this guide, decide you would much rather focus on your actual business and hire a Zooconomics accountant. Ok then… two options. We’ll just ignore that third one. An online accountant will be able to work through your bookkeeping needs significantly faster and with more efficiency than most business owners. However, if you want to attempt your own bookkeeping then feel free to read on. You’ll want to start with make some kind of documentation to record all of your income and outgoings. Most business owners (if they’re not using cloud-based accountancy software) will use a spreadsheet as well as a folder to hold all the physical paperwork. Get yourself a lot of plastic wallets and a set of dividers (at least twelve, one for every month). Label your dividers with each month and set them up in your folder with a (roughly) equal amount of sheets between them. Keep any bank statements you’re given during each month together in a plastic sheet. The same goes for your invoices/receipts given to you, and another plastic sheet for invoices/receipts that you give out (just in case they become Bad Debts). At the end of each day, week, or month (whichever you find most convenient) you will need to upload all of this information into your spreadsheet, so it’s recommended you keep it all in date order with any notes clearly attached to the paperwork. You will have to treat this folder like your business bible. It will contain all your financial information along with everything you will need for HMRC. Even if you lose all your electronic information, your folder will allow you to rebuild your accounts from scratch. Get a new folder each year for your finance details. It’s recommended that you keep your account details for a minimum of 5 years, however you might want to hold onto it for longer. You also need to make sure that everything you have sold or bought for your business is within this folder, and that there are no personal purchases whatsoever. Now that you have your folder ready to go, you’re going to want to get a spreadsheet ready. This way you will have an electronic record of all your accounts over the financial year. You can separate this by months or you can just have a master sheet that covers the entire year, it’s entirely up to you. This will cover the basics of what you need for your accounts; you may wish to add more depending on your business (for example you might need both a service and a product column), but you’ll figure that out as you go along. Ideally, you will want to fill out this spreadsheet on a daily basis if you want to keep completely on top of your accounts. Realistically however, you will probably fill this out when you get the time (which won’t be often considering you’re running a business). Try to book out a regular time each week or month to keep your accounts up to date, but keep in mind that the longer you leave it, the longer it will take you to update. There you go, bookkeeping made simple. When I say simple, I mean easy to understand but requires a lot of self-organisation, determination and a strange fondness of spreadsheets. If you fit that description then you’re ready to do your own bookkeeping and save yourself a few pennies each month by doing the work yourself. Or if you want to save yourself a lot of time, effort, and stress, you might simply want to speak with a Zooconomics accountant who will do all of the above for you.